Throughout the year we have a number of our samples on sale, all gowns are in brilliant condition, so if you are looking for a designer wedding dress without the designer price tag or if you are tight on time this may be a great option for you! To view our full collection take a look at our website and if you would like to come and try some of them on get in touch to discuss availability by calling us on 01727 848900 or emailing mydress@the-bride.co.uk. 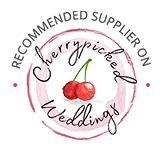 Meanwhile, if you’re still trying to decide whether a sample dress might be something you’d like to consider, why not have a read of what one of our gorgeous brides, Kathy, had to say about her experience. It was a pleasure getting to know Kathy during her short time at the shop, and we just loved hearing the story to how she found her perfect dress..
Answer: Classic, Elegant, Flattering, Comfortable & Special! It was a dress and jacket called ‘Mayfair’ by Suzanne Neville. My eldest son, Fyn picked it! He is quite a fan of the programme ‘Don’t tell the Bride’ and always comments on the bride’s dresses. Fyn described exactly what he thought would suit me and that it had to be very simple, not too much detail – with a small train. We found the dress online and agreed it was the style we wanted. The jacket enabled me to have two ‘looks’ and I loved the reverse bolero design. fall in love with your dress? a sample sale dress that surprised you? Answer:It was in excellent condition! The adjustments made by ‘The Bride’ were very minor but the end result was perfect, and I got the dress I wanted within my budget. Answer: My experience at ‘The Bride’ was great. My first appointment I went to the shop alone, as it was short notice. Lindsay made me feel very comfortable and made some recommendations to add the belt which really finished the dress off beautifully. From the initial phone call right through to collection, the Bride were amazing, working to very tight timescales (6 weeks from booking to wedding!). walk down the aisle in your dress? Answer: Incredible! I was completely relaxed, I felt very comfortable and so happy! starting their search for a wedding dress? Answer: Talk to the shop about your budget, they can offer solutions such as a sample dress. Try dresses on, as the sizing can be different in bridal wear. Small amendments to your dress can make a huge difference! I had a tiny panel inserted which enabled me to move more freely. Thank you so much Kathy for sharing your experience with us – you looked absolutely sensational in Mayfair and we love how Fyn picked it out for you!